There is nothing more romantic that strawberries dipped in chocolate. KILO decided to take a romantic and passionate turn for this premium vape liquid from new White Series line. KILO is by far one of the more popular premium e juice brands that carry in stock. They have created multiple top selling and highly sought after e liquids that we have been lucky enough to carry. KILO White Series is the counterpart to the Black Series line that they recently created. All of the e juice in The White Series are genuine and taste just as they are profiled to. White Chocolate Strawberry is a perfect example. It literally tastes like a ripe and juicy strawberry that has been dipped in a bowl of warm and melted white chocolate. The strawberry flavor notes come into play on the inhale, while the exhale is laced with the white chocolate flavoring. It has a strong aftertaste that will leave your mouth watering long after you've exhaled the vapor. It has a smooth throat hit that is a pleasure to vape on. It is not harsh nor unpleasant and is truly a great hit. White Chocolate Strawberry comes in a 70%/30% VG/PG blend. This means not only is it great for dripping, but it also works well in a tank. It also means that this premium vape liquid holds its flavor well while also producing thick and chunky clouds. As usual, all of the KILO White Series e liquids come in outstanding packaging.White Chocolate Strawberry comes in an elegant white box with gold accents. On the box sits the e juice brand name and flavor name written in gold font. The juice itself comes in a white bottle with color themed that matches the box. 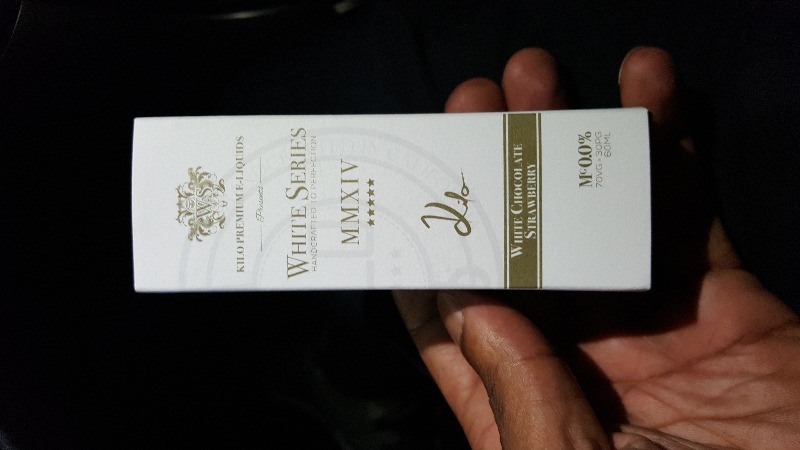 We carry White Chocolate Strawberry by KILO White Series in a 60ML bottle in 0MG, 3MG, and 6MG nicotine levels. If you are looking to try something new, than this vape liquid is perfect for you! To strawberry, no hint of any other flavor and left a weird taste in my mouth, would not recommend.